I'm having a great time in Europe, although duh, of course I am. After the longest flights ever, we got here. We spent three and a half days in Budapest, staying with Alexs sister and her husband and kids. We did a little bit of exploring of Budapest but spent most of the time visiting with his family, and then yesterday we took a 4 hour train ride with his parents to the border of Hungary. Then we were picked up by his cousin and driven about half an hour to his hometown in Slovakia. I'd tell you where it is but Alex is busy right now and I don't speak Hungarian. So far almost no one has spoken English so I've had a very quiet trip. I sit quietly while everyone talks and talks and talks and every so often Alex will translate. Besides not being able to communicate too well, everyone has been fantastic. His family has made a huge effort to make sure I can eat everything. It's pretty great. We haven't eaten out at all, since his mom has been cooking every night for us, except for today when we went to his aunts house, who made stuffed cabbage and then, after we'd eaten all we could, brought out a surprise course of chicken and mashed potatoes (her own chickens, her own potatoes, her own wine) which was fantastic but I was pretty sure I was going to die. 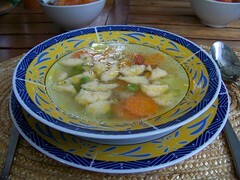 The picture I'm posting here is of a soup his mom made, a simple vegetable soup that usually has gluteny dumplings. She found a gluten free flour mix, and used it to make dumplings, so I could eat it. It means a lot to me, as you can imagine if you know anyone who says "oh, it just has a little flour, you can eat it" that they're making such an effort. Anyway, I'm writing down everything I eat, and posting pictures when I can to my Flickr (flickr.com/jillelise) and will make big updates later on. I just wanted to post this one picture of soup and dumplings because it was so good. Bye!! I hope you're collecting some recipes to bring back for us!! you don't have to speak hungarian to help in the kitchen! cooking is its own language. I am interested in much cooking that food culture and you of your country make. And I support your site. If there is time, please come in my site. So jealous! I wish I cold be there too.